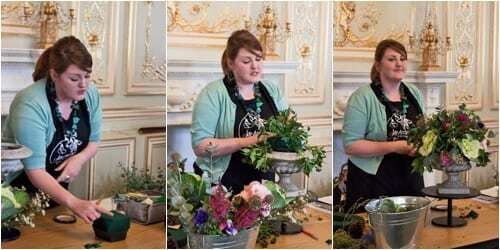 Earlier this month, I was invited to attend a Crafternoon Tea workshop which was being run by florist Jay Archer at Fetcham Park in Surrey. It was lovely to meet Jay as we’d only met each other ‘virtually’ before, via Twitter. And this was her first Crafternoon Tea event. What a lovely afternoon it was…! To start with, the venue is absolutely stunning. Fetcham Park is a Grade II listed Queen Anne mansion, built in around 1705. And the Grand Hall where the workshop took place is so beautiful…with its gold leaf gilding on the walls and mural on the ceiling. 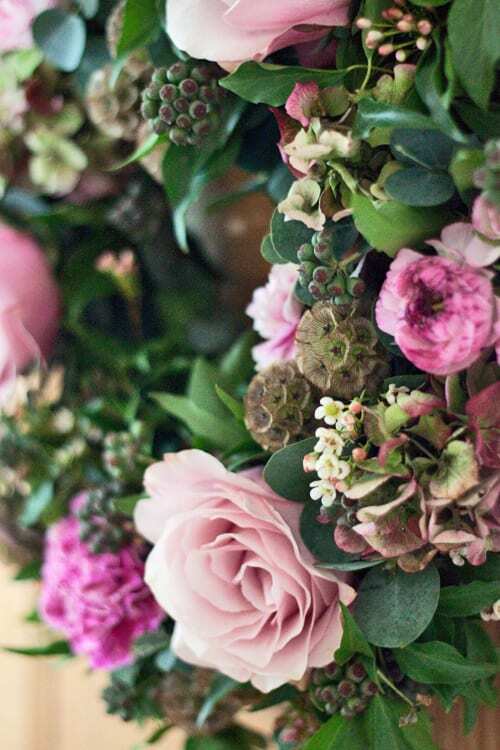 Jay started the workshop by demonstrating how to make a tablecentre, using berried ivy, eucalyptus, ornamental kale, ‘Secret Garden’ roses, hydrangeas, astilbe, carnations, waxflower, scabiosa seed heads and anemones. She talked us through how to create the design, with lots of hints and tips. 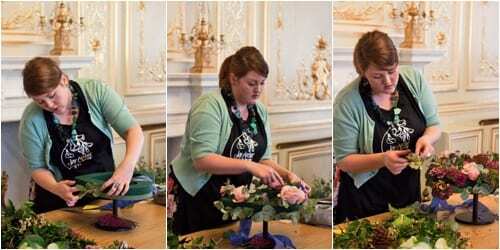 Then, using the same flowers and foliage, she demonstrated how to make a floral heart design. After Jay’s demonstrations, we had a lovely afternoon tea of scones, jam and cream with cups of tea, supplied by A Cup of Vintage. And then it was our turn to make either of the designs. 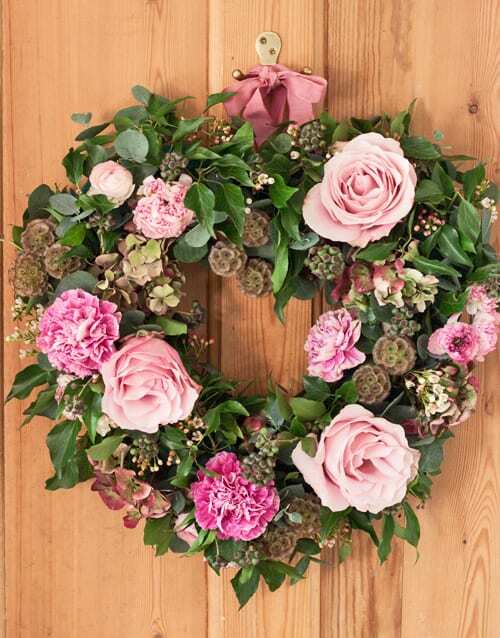 I decided to make the floral heart as I’ve not made one for a very long time. Attending Jay’s workshop was such a lovely way to spend a Saturday afternoon. 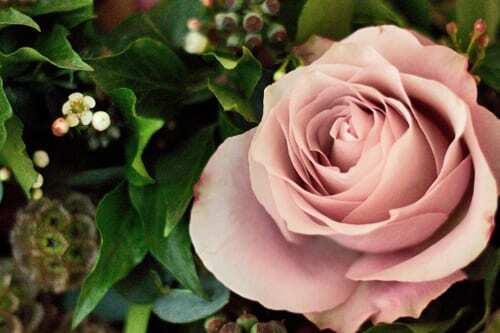 I was really impressed by her attention to detail…from her joining instructions which she emailed in advance, to our name place holders on the tables and tags detailing the ingredients in our arrangements. 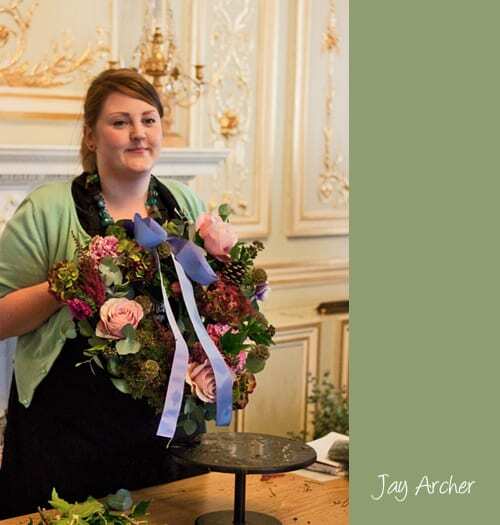 If you’d like to learn how to make floral designs for your home, click here for the 2013 Crafternoon Tea workshop dates. I’ll be featuring an interview with Jay on Flowerona in the future. In the meantime, if you’d like to keep up-to-date with her news, she’s on Twitter and Facebook, plus has a blog. I’ve had the pleasure to work with this very talented lady this Summer. I adore her style. Well done Jay! 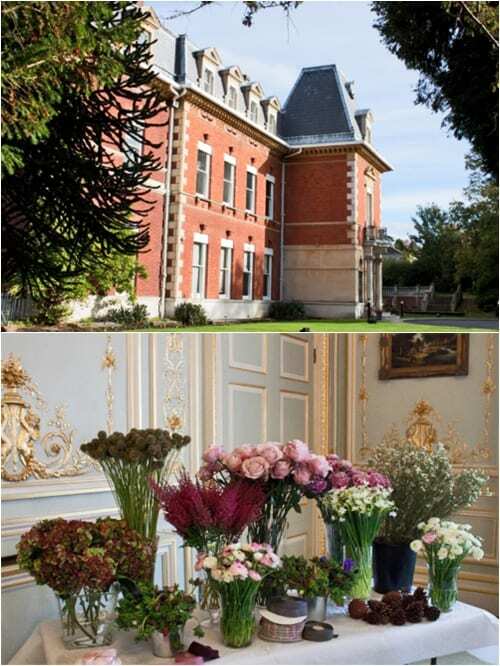 the workshop was in such a beautiful venue. Many thanks Krishanthi & Benjamina for your lovely comments!